There currently are no employment positions available. It’s wonderful to see Alchemist volunteers and interns go on to do exciting new things, and it’s safe to say the experience one gains working with us can help build careers in community service. For example, Amy Edmonds, who completed an internship with us, went on to work for the Ecology Center’s Farmers’ Market EBT Program as Program Assistant and is currently an Analyst at the Department of Family and Community Medicine at UCSF. Some other intern success stories include one who went on to work for an urban gardening non-profit educating youth on gardening; another has served on our board of directors for six years. Farmers’ Market Intern — an outgoing, conscientious, and reliable morning person to facilitate processing of CalFresh benefits so that EBT card users can buy fresh produce; to deliver health and nutrition information. We are especially looking for interns with Tuesday, Wednesday or Thursday morning availability. COMPENSATION: Unpaid. Mileage/transportation reimbursement provided up to $50/month. 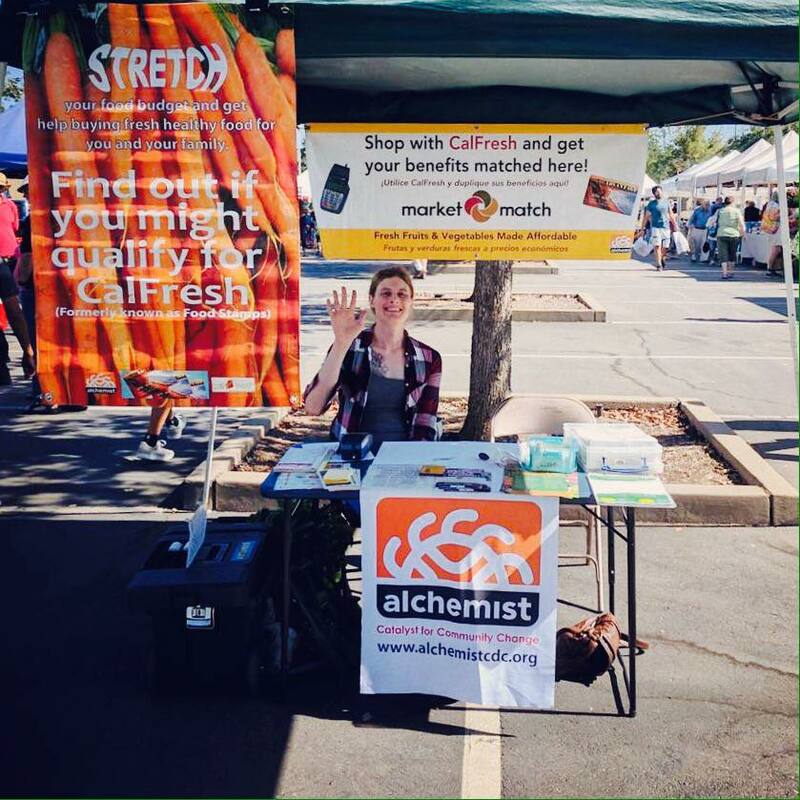 Alchemist CDC works at 9 farmers’ markets in Sacramento County to facilitate the use of Calfresh (food-stamps) benefits through customers’ Electronic Benefits Transfer (EBT) card. We provide a scrip system that is easy to use for both customers and vendors. The CalFresh program (also known as SNAP, EBT or food stamps) offers qualifying lower income individuals financial assistance in purchasing food for themselves and their families, but it takes facilitators like Alchemist CDC to make it possible for the benefits to be used with the vendors at farmers markets who aren’t set up to process electronic payments. Our work gives CalFresh beneficiaries access to fresh, local, affordable produce and brings additional customers to help the markets and farmers thrive. This effort aligns with Alchemist CDC’s vision of a vibrant, equitable and diverse urban Sacramento. Farmers’ Markets are a great asset to communities, benefit surrounding businesses, and can lead to improved health for area residents. Staff CalFresh scrip distribution table at one farmers’ market each week. Promote program to farmer vendors at markets. Inform customers about CalFresh eligibility and application guidelines. Staff information table at occasional community events. Ensure compliance with Federal guidelines for accepting CalFresh. Develop and implement strategies for community outreach to promote Farmers’ Markets to CalFresh recipients. Must be at least 17 years of age. Must be a High School graduate or equivalent (GED/CHSPE) by May 31st, 2018. Basic math skills are very important. Self motivated with good work habits. Able to stay on task without constant supervision. A plus if you are able to transport equipment to market each week (fits in most cars). You will additionally be expected to work four hours/week (usually on a weekday during regular business hours) for conducting outreach (some of which can be conducted from home).